Unique technology allows for easy sample collection, transport, storage and release. Increases efficiency in the lab by providing multiple steps in the sample handling process in one comprehensive system. Reduces costs that can occur with sample collection, transport and storage. Protects sample integrity with its unique structure. Our unique patented dried-matrix technology allows the porous matrix to collect, transport, store and release a sample upon demand – all in one simple system. Reduces potential costs–Can eliminate costs associated with biohazard shipping and transportation, while maintaining efficiency in the lab. Protect sample integrity–Preserves, stabilizes and maintains the sample with a patented proprietary Porex technology. Decreases workflow time–Shortens analysis time by eliminating the reliance on additional kit components. Reduces overall sample preparation costs–Combines multiple steps in the sample preparation process into one system. 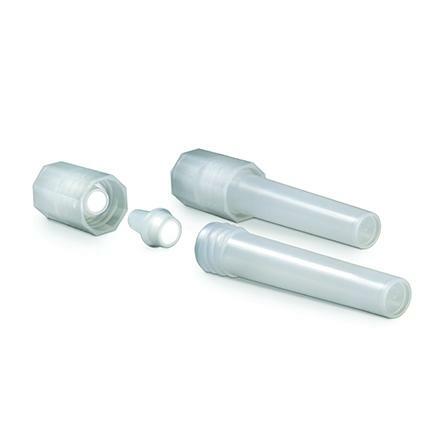 Prevents leakage–Leak resistant, interlocking screw cap closure for safe sample shipment for both intra-lab or inter-lab transport. Can provide functionality–Functional materials can be added to help isolate target analytes, allowing for customization.